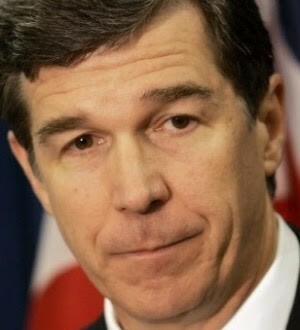 NORTH CAROLINA: State AG Roy Cooper Says Amendment One Is Now Surely Doomed, Will Drop His Defense - Joe.My.God. Following a ruling today from the 4th Circuit Court of Appeals in favor of marriage equality, North Carolina’s Attorney General Roy Cooper held a press conference in response, saying that as a result of the ruling, North Carolina’s own ban on the freedom to marry, “will almost surely be overturned.” He added that the North Carolina’s ban, known as Amendment One is now indefensible, saying “It’s time to stop making arguments we know will lose.” The 4th Circuit has jurisdiction over federal courts in North Carolina. Cooper added, “The ruling does predict our law will be struck down.” The 4th Circuit ruling will become law in 21 days. During that period of time, motions for stay can be made. “Our attorneys have vigorously argued this case every step of the way, but the 4th Circuit ruling is clear…There are really no arguments left to be made,” said Cooper. UPDATE: Here’s Cooper’s full statement. After reviewing the 4th Circuit decision and consulting with attorneys here, I have concluded that the State of North Carolina will not oppose the cases moving forward. In addition, the State of North Carolina will acknowledge the 4th Circuit opinion that marriage is a fundamental right and that our office believes that the judges are bound by this 4th Circuit decision. In all these cases challenging state marriage laws, our office along with other attorneys general and state attorneys across the country have made about every legal argument imaginable. Since the US Supreme Court ruled in the Windsor case, all the federal courts have rejected these arguments each and every time. So it’s time for the State of North Carolina to stop making them.